Ah death, the ultimate loss, so they say…and yet it doesn’t have to be. There are two areas to address; the fear of our own death and the fear of the death of a loved one. I am not sure I can get to both today but I sure as hell, are you catching my irony, will address the fear of death of a loved one. The grief and paralysis and emptiness that most choose to endure when someone close to them makes what I call their transition from the game of life out of this particular game of life is quite the norm. In fact, the vast majority would say it is necessary and unhealthy if you don’t “grieve” for a loved one. Well I will disagree wholeheartedly though I would never fault anyone for choosing to go that route. I lost my sister, best friend, soul mate, and regular partner in crime 15 years ago in the WTC. That was, luckily for me, 5 years after I had found a way to live and think that was consistent with the laws of the universe. I had dealt with my fear of losing a loved one and was prepared, truly prepared for that experience in the most life giving way. I did not grieve for I know everyone chooses their exit strategy, though maybe not consciously for most, and I trusted her judgment that this was her time. She is a powerful woman, being, sister, friend, soulmate and I respect her decision and the appropriate timing and way of her transition. Also, lucky for me, I have a full life so I didn’t need to use my sister’s transition as an excuse to avoid my life. I was blessed with the other parts of it and wonderful people flowing into the void left by her departure. I was blessed with aspects of her to be found in family and friends. Mostly I was blessed with her presence strong and constant in my life though I couldn’t call her or meet her for drinks. In fact I found her with me every time I thought of her, even better than a call in some ways as I was sure to reach her. And I think of her daily and often with love and appreciation and joy for the gift. The reason I bring this up is that recently I have found more of her presence in my life and I link it to synchronous series of events. First I started meditating with Holosync, which is another story in itself so let me just get to that another time. I had heard of Holosync in 2003 and recommended it to many but since I was practiced in meditation and even found to enter the meditative state in minutes via a biofeedback test, I thought I didn’t need it. Actually I was attached to doing it the “pure” way so here we are in 2015 and I decided to try it. Love it, by the way. It has a way of clearing stuff out that you aren’t even aware is there and heightening your experience of every joyful, exciting, loving experience and more and I am just getting started. Second a friend’s daughter died suddenly at a young age and I was at the memorial service and watching all the sadness and pain that most put themselves through and knowing it doesn’t have to be that way. As much as I know this is how most handle the death of a loved one, especially a child and young (30s which to me is very young…lol), I also know that it absolutely doesn’t have to be that way and it is a choice and honestly, not a very smart choice when you understand how this world actually works but we will get to that later. Now I will defend your right to choose to handle it that way and never judge and most would disagree with me but I know what I know and it is a choice. You can deal with the transition of a loved one whom you love more than life itself with joy and grace and no grief. Not only that but it serves you and them to do so and it allows them to be with you more fully in your now. But I am not here to convince you of that. You get to do life any way you want, even if you choose to suffer temporarily. So the long story gets longer…so as I am doing the holosync just after the second and third event…lol… even without intellectually coming to any actual conclusion, my sister’s presence was felt more strongly and we had a lovely conversation while I meditated. No, I didn’t see her but I felt the energy of her and the banter back and forth (and jokes even) was definitely exactly like being with her. She was my sister but more open and even more powerful, and no opinionated fear based aspect which could be a part of her (as with all of us). I realized that I had been holding that experience of her away because I didn’t know who she really was without that baggage. In life, I could hold back enough of what I thought she would give me grief about so we could enjoy our moments fully, and we did, but she didn’t know all my details. The important stuff, yes, but the little and not so little details especially when I knew she would be irritated and she could get really irritated, not so much. I didn’t fear for her not loving me and I wasn’t seeking her approval for I would do what I was going to do no matter what. I just didn’t want to deal with the behavior that went with her disagreement. When she made her transition I realized she would know everything in my heart and soul and what I did that she didn’t approve of in the past and I didn’t want to hear it really…lol I also realized that her baggage had been my baggage for when you see it in another it is within you yourself. So though I felt her presence and love fully and perfectly with never a negative note, I did not seek to communicate with her or even ask her her thoughts about anything or any decisions in my life. I had my own inner being for that and we were a great team. Well come to find out she is part of the inner team, my inner team, the loved ones who you are truly connected to, friend or blood relatives, are part of your spiritual family. So now she is part of the conversation, part of my life even more than just a memory and a loving presence. What I am trying to say is that we never lose anyone who really is a part of us, the ones we truly love. They are always intertwined in our life intimately and as fully as we allow. There is never a real reason to mourn or grieve for the loss, for it isn’t a loss but rather just a change in how they are in your life. The love is there coming at you and you giving it to them. Life is always going to change and thankfully so for if it didn’t change, and life didn’t change, we would all die of boredom and life as we know it would cease to be, actually life would cease to be period. You just have to get happy, appreciative…stop fearing and do what you love, stop judging and let go, stop shooting yourself in the foot and wondering why you can’t walk…lol…and enjoy the amazing experiences that are yours to have every moment. 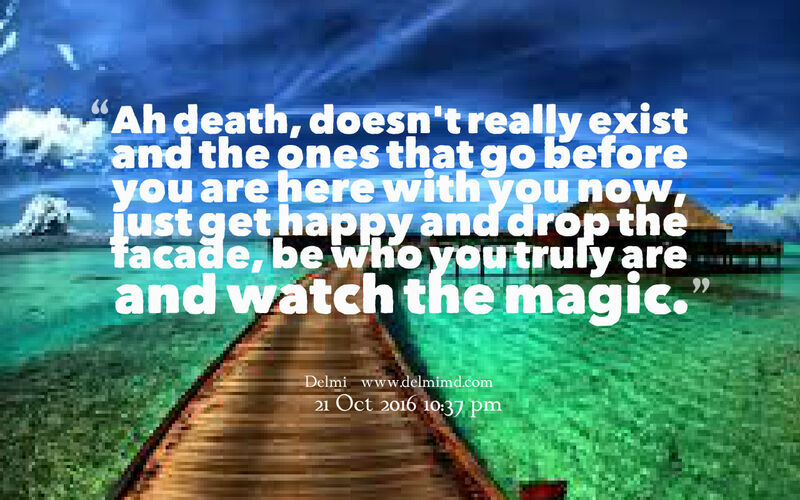 The irony is that if you stop mourning and grieving and judging and regretting and and and… you will actually have your loved one as a real experience in your life in the now and it will be even more amazing than you can possibly know. Great love and deep moving experiences and epic times await you.